Blood cells all follow a set pattern of development. They form in the bone marrow (the spongy part inside some of the bones) and then pass into the blood. White blood cells which fight infections. There are two main types of white cell: neutrophils and lymphocytes, which work together to fight infection in the body. Adult acute lymphoblastic leukaemia (ALL; also called acute lymphocytic leukaemia) is a cancer of the blood and bone marrow. This type of cancer usually gets worse quickly if it is not treated. 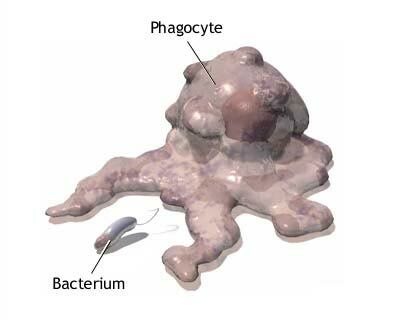 The lymphocytes are not able to fight infection very well. Also, as the number of lymphocytes increases in the blood and bone marrow, there is less room for healthy white blood cells, red blood cells, and platelets. This may cause infection, anaemia, and easy bleeding. The cancer can also spread to the central nervous system (brain and spinal cord). Having a certain genetic disorder such as Downs syndrome. These and other symptoms may be caused by adult acute lymphoblastic leukaemia or by other conditions. Tests that examine the blood and bone marrow are used to detect (find) and diagnose. Complete blood count: A procedure in which a sample of blood is drawn and checked for the following: The number of red blood cells, white blood cells, and platelets. Once adult acute lymphoblastic leukaemia has been diagnosed, tests are done to find out if the cancer has spread to the central nervous system (brain and spinal cord) or to other parts of the body. Because CML develops slowly, it is difficult to detect in its early stages. Sometimes it is discovered only when a blood test is done for another reason. some people may notice a generalised itching. If you have any of the above symptoms, it is important to see your doctor, but remember, they are common to many illnesses other than chronic myeloid leukaemia. Chronic myeloid leukaemia is a blood and bone marrow disease that develops slowly. It has three phases. The phase is determined by the number of blast cells in the blood and bone marrow and the severity of symptoms. Most people are diagnosed when the CML is in the chronic phase. At this time CML progresses very slowly and is often stable for long periods. It is sometimes called the ‘stable phase’. There may be few symptoms and most people find they can lead a normal life. It is rare to need to go into hospital. Treatment can be given as an outpatient and usually does not cause many side effects. You will have regular appointments to check your condition and to have your blood tested. Although it varies from person to person this phase lasts on average about 4–5 years but can be longer. In chronic phase CML there are 5% or fewer blast cells in the blood and bone marrow. After some time, the leukaemia may gradually move into an accelerated phase, during which the disease is developing more quickly. 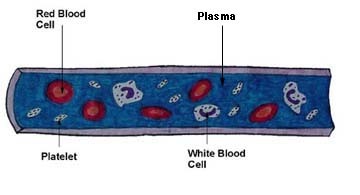 In this phase there are 6–30% blast cells in the blood and bone marrow. Sometimes this change may be picked up from your blood tests, in which blast cells can be seen, or from symptoms you may have. These may include feeling very tired (due to anaemia), infections, bruising or bleeding. If you notice any of these symptoms, let your doctor know straight away. The treatment for the accelerated phase is often more intensive than in the stable phase and you may need to spend some time in hospital as an in-patient. After some time in the accelerated phase, usually months, the leukaemia ‘transforms’ into a ‘blast phase’, which is more like an acute leukaemia. In this phase much of the bone marrow has been replaced by many very immature (blast) cells. In this phase there are more than 30% blast cells in the blood and bone marrow. In some people chronic myeloid leukaemia changes quickly from the chronic phase to the blast phase without going through the accelerated phase. If tiredness, a high temperature and an enlarged spleen occur during the blast phase this is known as blast crisis. Rarely, CML develops into a condition called myelofibrosis. This means that the bone marrow cannot make red cells, white cells or platelets because it is replaced by scar tissue (fibrosis). A relapse is when the number of blast cells increases after a period of remission. Remission is when the number of blast cells in the blood and bone marrow goes back to normal following treatment. Complete remission means that all of the blood and bone marrow tests are normal. A molecular remission is when the Philadelphia chromosome cannot be found even by a very sensitive test called PCR. Usually you will begin by seeing your family doctor (GP) who will examine you and take a blood test. If the results of the test are found to be abnormal your GP will refer you to hospital for specialist advice and treatment. In CML the blood test will generally show a high number of white blood cells. The doctor at the hospital will take your full medical history before doing a full physical examination and a blood test which checks the number and stage of development of all the different types of blood cell. If the blood test shows that leukaemia cells are present, your doctor will want to take a sample of your bone marrow. This is to confirm the diagnosis so that the best treatment can be planned. A small sample of bone marrow is taken from the back of the hip bone (pelvis) or occasionally the breast bone (sternum). It is looked at under the microscope by a pathologist to see if it contains any abnormal white blood cells. The pathologist will be able to tell which type of leukaemia it is by identifying the type of abnormal white cell. The bone marrow sample is normally taken under a local anaesthetic. You are given a small injection to numb the area and a needle is passed through the skin into the bone. A small sample of the bone marrow is then drawn into a syringe for examination under a microscope. The test can be done on the ward or in the outpatients department. The whole procedure lasts about 15–20 minutes. It may be painful, but this only lasts a short time as the marrow is drawn into the syringe. You may be offered a sedative to reduce any pain or discomfort during the test. Sometimes a small core of marrow is needed (a trephine biopsy) and this procedure takes a few minutes longer. You may feel bruised after the test and have an ache for a few days. This can be eased with mild painkillers. The sample of bone marrow is examined to find out if the Philadelphia chromosome is present. This information helps the doctors to make decisions about treatment. It can take about a week to get the results of a bone marrow biopsy. Most people with CML have a genetic abnormality known as a Philadelphia chromosome which can be detected by laboratory tests. Every cell in the body has a nucleus that contains chromosomes. Chromosomes are long structures made up of DNA. DNA determines how the cell looks and acts. The Philadelphia chromosome develops when part of chromosome 9 (the ABL gene) wrongly attaches to chromosome 22 (the BCR gene) during cell division. This creates a new gene, known as BCR-ABL which produces a specific new protein. The protein causes the production of an enzyme called tyrosine kinase, which leads to the chronic phase of CML by stimulating the production of abnormal blood cells by the bone marrow. The Philadelphia chromosome is not inherited and cannot be passed on to your children. Blood cells are normally produced in a controlled way, but in leukaemia, the process gets out of control. The lymphocytes multiply too quickly and live too long, so there are too many of them circulating in the blood. 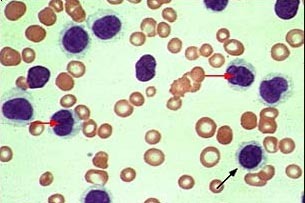 These leukaemic lymphocytes look normal, but they are not fully developed and do not work properly. Over a period of time these abnormal cells replace the normal white cells, red cells and platelets in the bone marrow. The disease usually develops slowly and many people with chronic lymphocytic leukaemia do not need treatment for months or years. Some people need treatment straight away. What causes chronic lymphocytic leukaemia? The cause of CLL is not known, but research is going on all the time to try to find out. Like other leukaemias, it is not infectious and cannot be passed on to other people. For most people, there is no evidence that it is inherited or that your children are at any increased risk of developing the disease. Because the disease develops slowly, it is difficult to detect in its early stages. Some people have no symptoms and the disease may be discovered only when a blood test is taken for a different reason. People with CLL are more likely to get infections because they have a shortage of healthy white blood cells to fight off bacteria and viruses. A lack of red blood cells (anaemia) causes tiredness and sometimes breathlessness. There are not enough red blood cells because the abnormal lymphocytes are taking up too much space in the bone marrow. Your platelet count may be low too, for the same reason. This can cause unexplained bruising or bleeding, such as nosebleeds. Abnormal lymphocytes may collect in lymph glands and cause swellings in your neck, armpits or groin. The swollen lymph glands are usually painless but may be sore. Your spleen may become enlarged and cause a tender lump in the upper left-hand side of your abdomen. Sweating or a high temperature at night can also sometimes occur. Some people lose weight. Your GP will examine you and carry out a blood test. If this blood test shows that your blood cell counts are abnormal, your GP will then refer you to a hospital specialist, called a haematologist, for specialist advice and treatment. The doctor at the hospital will take your full medical history and do a physical examination, checking for any enlargement of the lymph nodes, spleen or liver. You will also have further blood tests to examine your blood cell counts in more detail. If your blood tests show leukaemia cells, you may need to have a bone marrow test to be sure of the diagnosis and so that the best treatment can be planned for you. A small sample (biopsy) of bone marrow is taken from the hipbone (pelvis) or the breast bone (sternum), and looked at under the microscope to see if it contains any abnormal white blood cells. The doctor will be able to tell which type of leukaemia it is by identifying the type of abnormal white cell. The bone marrow sample is taken under a local anaesthetic. You are given an injection to numb the area and a needle is pushed gently through the skin into the bone. A sample of the marrow is then drawn into a syringe. Usually a small core of marrow is needed (a trephine biopsy) and this takes a few minutes. The test can be done on the ward, or in the outpatients department. The procedure can be painful, but only takes about 15 minutes. You may be offered a mild sedative to reduce any pain or discomfort during the test. Some people with stage A chronic lymphocytic leukaemia never have treatment if their illness is not causing any symptoms and is progressing only very slowly. There is no advantage to having treatment if your CLL is at an early stage, unless you have symptoms. But it is still important to attend for regular check-ups and blood counts, as this is the main way your doctor has of monitoring the progress of the leukaemia. Treatment is only started if and when the symptoms become troublesome. If treatment is necessary, you will be started on medication either as tablets, or by injection into a vein (intravenous chemotherapy). Your specialist will be able to tell what is the best form of treatment for you by monitoring the level of cells in your blood. Usually, people with CLL begin on chemotherapy tablets and may then have chemotherapy by injection if their symptoms do not continue to improve. Steroids may be given along with the chemotherapy. This is to help the chemotherapy work more effectively. Monoclonal antibodies such as alemtuzumab and rituximab may be used to treat CLL. These can recognise CLL cells and destroy them, while having little effect on normal cells. Some younger patients are offered treatment with high dose chemotherapy and stem cell transplant. This treatment is experimental, but may result in a long period with no active disease (remission) for some people. Radiotherapy is sometimes used to treat bulky enlarged lymph nodes, or enlarged spleen. Alternatively, an enlarged spleen may be removed surgically (splenectomy). In hairy cell leukaemia there is an overproduction of one type of white blood cell: the B lymphocyte. The term `hairy cell' refers to the hair-like outgrowths (projections) that can be seen on the surface of the white cells when they are examined under a microscope. In leukaemia the normal pattern of white cell development is disrupted and too many immature white blood cells are produced. 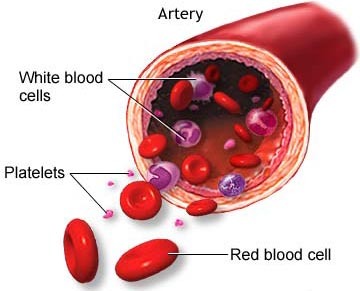 Over time, the bone marrow slowly becomes taken up with production of these abnormal white cells, and so the number of normal white blood cells, red cells and platelets that can be produced is lowered. In hairy cell leukaemia the abnormal white blood cells build up in the spleen and cause it to enlarge. The enlarged spleen can also remove normal blood cells from the bloodstream, which can lead to a further lack of red blood cells and lower numbers of normal white blood cells. Hairy cell leukaemia is very rare and only makes up 2-5% of all types of leukaemia. It is found mostly in people between 40 and 60 years old and is more common in men than women. The condition usually develops very slowly, so the term chronic is used to describe it. What causes hairy cell leukaemia? The causes of hairy cell leukaemia are not known. Hairy cell leukaemia, like other cancers, is not infectious and cannot be passed on to other people. Since hairy cell leukaemia normally develops slowly it may not cause symptoms for a long time and often may only be diagnosed after a blood test has been taken for other reasons. When hairy cell leukaemia causes symptoms these can be general, such as weakness, weight loss, infections and breathlessness. Other people see their doctor because they feel tired or look pale due to a lack of red blood cells (anaemia). Some people get frequent infections because there is a shortage of healthy white blood cells that normally destroy bacteria. Others will be able to feel a full or tender lump on the left side of the abdomen, due to an enlarged spleen. These symptoms can be caused by a number of different conditions other than leukaemia, but any symptoms that get worse or last for a few weeks should always be checked by your doctor. Your doctor will examine you and do a blood test. Depending on the result, you will then be referred to a hospital for specialist advice and treatment. The doctor at the hospital will take your full medical history, do a physical examination and further blood tests. The blood tests will show the number of abnormal white blood cells and the typical appearance of `hairy' cells may also be seen in the blood sample. People with hairy cell leukaemia may also have low numbers of platelets and red cells. You will have regular blood tests throughout your treatment to check the number of normal cells in your blood (this is known as a blood count). Other blood tests may also be used to check your general health. If a blood test shows abnormal blood cells, the hospital doctor will normally want to take a sample of bone marrow to examine under a microscope. This helps to give more specific information about the condition. The sample is usually taken from the hipbone (pelvis), or occasionally the breastbone (sternum). The bone marrow sample is taken under a local anaesthetic. You are given a small injection to numb the area and a needle is then passed gently through the skin, muscle and bone. A tiny sample of bone marrow is drawn out using a syringe. Sometimes a small core of marrow is needed (a trephine biopsy) and this takes a few minutes longer. The test may be done on the day ward or in the outpatient department. The procedure can be uncomfortable and even painful at times, but only takes about 15 minutes. Sometimes you may be prescribed a sedative beforehand to help to relax you during the test. After the test you will feel bruised and you will be given painkillers to take until the pain or soreness has gone. Hairy cell leukaemia is a very treatable disease. Quite often, as it is slow growing, it does not need to be treated straight away. If you do not need treatment immediately your doctor will still monitor you by doing regular blood tests. Your doctor will recommend treatment when there are signs that the number of abnormal white cells in the body is increasing or you are starting to get symptoms. There are several ways of treating hairy cell leukaemia: these include chemotherapy using Cladribine (Leustat) or deoxycoformycin (Pentostatin). Splenectomy (removal of the spleen) and interferon may also be used. When treatment is needed, your doctor is most likely to suggest treatment with drugs (chemotherapy). Surgery is less commonly used. Chemotherapy is the use of anti-cancer (cytotoxic) drugs, which work by stopping the leukaemia cells from multiplying. Cladribine and deoxycoformycin can often get rid of all signs of the leukaemia for some time, which is known as a remission. Cladribine (Leustat). The drug is given as a drip (intravenous infusion) or as injections under the skin, usually every day for 7 days. This may be repeated. Common side effects include a high temperature (fever) and infection, which will need to be treated with antibiotics. Other possible side effects include headache, weakness, feeling sick, skin rashes and muscular aches. It is important to discuss with your doctor any side effects that you have. Deoxycoformycin (Pentostatin). The drug is given as an intravenous injection (an injection into a vein) usually every 2 weeks. Side effects are often mild and include infections, which may need to be treated with antibiotics, and mild feelings of sickness which is usually well controlled with anti-sickness drugs. Other possible side effects include skin rashes, high temperatures (fever) and temporary changes in kidney function. Your doctor will give you advice about how to cope with any side effects you have and give treatment for them if necessary. Interferon is a type of immunotherapy, which means that it boosts the body's own immune system. The exact way in which interferon works in hairy cell leukaemia is not fully understood, but it is thought that it may help to activate the body's immune system and that it may also work directly against the cancer cells. The drug is given as an injection under the skin usually three times a week. The most common side effects are flu-like symptoms such as chills, a high temperature (fever) and aching joints. Simple medicines such as paracetamol will often relieve these effects. Splenectomy is the surgical removal of the spleen. For some people who have an enlarged spleen, removing it can help to reduce symptoms. However, the illness will still be present and further treatment is usually necessary. In a small number of people no further treatment will be needed following splenectomy. The aim of treatment for hairy cell leukaemia is to bring about a remission, which means that the disease is inactive or dormant, although it may still be present. The remission may last for several years, however as hairy cell leukaemia usually comes back (recurs), your doctors will monitor you with blood tests during your remission. If the leukaemia does recur, your doctor will discuss another course of treatment with you. Doctors cannot predict how long a disease will stay in remission, but with current treatments, hairy cell leukaemia can be controlled for long periods. Acute myeloid leukaemia is a rare type of cancer, affecting approximately 2,000 adults and 50 children per year in the UK. Leukaemia is a cancer of the white blood cells (phagocytes) Acute myeloid leukaemia is an overproduction of immature myeloid white blood cells. The immature cells are sometimes referred to as blast cells. Normally, white blood cells repair and reproduce themselves in an orderly and controlled way. In leukaemia, however, the process gets out of control and the cells continue to divide, but do not mature. These immature dividing cells fill up the bone marrow and prevent it from making healthy blood cells. As the leukaemia cells do not mature, they cannot work properly, which leads to an increased risk of infection. As the bone marrow cannot make enough healthy red blood cells and platelets, symptoms such as anaemia and bruising also occur. Acute myeloid leukaemia can affect adults of all ages, but is more common in older age groups. It is rare in people under 20. What are the causes of acute myeloblastic leukaemia? The exact causes of acute myeloid leukaemia are unknown. Research into possible causes is going on all the time. In very rare cases, leukaemia may occur after exposure to chemicals such as benzene, formaldehyde and other solvents used in industry. Large doses of radiation and some drugs used to treat other cancers may also rarely cause leukaemia, many years after people have received them. People exposed to high levels of radiation due to atomic bomb explosions or nuclear industry accidents are more likely to develop leukaemia than people who have not been exposed to radiation. People with certain blood disorders (such as myelodysplastic syndrome) or some genetic disorders, including Down's syndrome, are known to have a higher risk of developing leukaemia. The main symptoms of acute myeloid leukaemia are caused by the increased number of immature white cells (blast cells) in the bone marrow, which reduces the production of normal blood cells. Anaemia (a lack of red blood cells), which can cause people to look pale, feel very tired and sometimes breathless at the slightest effort. Feeling generally unwell and run down - this may be caused by anaemia or repeated infections. Repeated infections - for example, a sore throat or sore mouth caused by a lack of white blood cells. Aching joints and bones - bones may be affected by leukaemia cells. Unusual bleeding caused by a reduction in the number of platelets. This may include bruising (bruises may appear without any apparent injury), bleeding gums, frequent nosebleeds, and heavy periods in women. As well as bruising more easily than normal, a particular type of bruising can be seen. This consists of small blood-like spots called petechiae, usually seen on the legs or in the mouth. Rarely, areas of the skin or gums may be affected by the leukaemia cells. The affected areas can appear sore and take a long time to heal. Usually you begin by seeing your doctor who will examine you and take a blood test. If the results of the test are abnormal in any way, your doctor will refer you to hospital for advice and treatment from a doctor who specialises in the treatment of blood problems (known as a haematologist). Most people with AML are referred for treatment at a specialist haematology unit where a group of specialist doctors work together. This is known as a multidisciplinary team and includes one or more haematologists, a medical oncologist (chemotherapy specialist) and a clinical oncologist (radiotherapy specialist). The team will also include specialist nurses, social workers, dieticians and physiotherapists. The doctor at the hospital will take your full medical history before doing a physical examination and a more specific blood test, which checks the numbers of all the different types of blood cell. If the blood test shows that leukaemia cells are present, your doctor will want to take a sample of your bone marrow. This is the most important test for finding out if you have leukaemia, and gives information that the doctors need to plan the best treatment for you. A sample of bone marrow is taken from the back of your hipbone (pelvis) or, less commonly, the breastbone (sternum). It is looked at under a microscope by a pathologist to see if it contains any abnormal white blood cells. The pathologist will be able to tell which type of leukaemia it is by identifying the type of abnormal white cell. The bone marrow sample is taken under a local anaesthetic. You are given a small injection to numb the area and a needle is passed gently through the skin into the bone. A small sample of the marrow is drawn out into a syringe for examination under the microscope. The test can be done on the ward or in the outpatients department. The whole procedure takes about 15 minutes. It may be uncomfortable but it only lasts a short time as the marrow is drawn into the syringe. Some hospitals give a short-acting sedative which makes you feel drowsy or sleepy while the biopsy is taken. Sometimes a small core of marrow is needed (a trephine biopsy). This procedure takes a few minutes longer. A special type of needle is passed through the skin to the bone marrow. The needle has a tip that can cut out a sample of the bone marrow. Your doctor may ask you to have further tests, which may include a chest x-ray to check that your lungs and heart are healthy. There are several classification systems that break AML down into various sub-types. The most commonly used system in the UK is the French-American-British (FAB) system. These terms describe the exact type of cell that is being overproduced and the stage of development (maturation) of the leukaemia cells. The blood and bone marrow samples will be checked by haematologists and pathologists to find out which type of leukaemia it is. They will look to see exactly which type of cell has become leukaemic and at which stage of their development. The cells may also be tested with antibodies for specific proteins on their surface. This process is known as immunohistiotyping. The genetic make-up of the leukaemia cells will also be examined, as the different types are associated with particular genetic changes. Knowing the exact type of leukaemia, from the results of the cytogenetics tests, helps the doctors to know which treatment is likely to be most effective in treating the leukaemia. Chemotherapy is the main treatment used, as research has shown that certain types of chemotherapy drugs can be very effective in treating AML. Most patients with acute myeloid leukaemia go into remission after chemotherapy and more and more people are being cured. People who have promyelocytic AML (type M3) will also be treated with a drug called ATRA (all trans-retinoic acid). It is a specialised form of vitamin A and is also known as tretinoin (Vesanoid(r)). ATRA is given for up to three months alongside chemotherapy treatment as it makes the leukaemic cells mature (differentiate) and so can reduce the leukaemic symptoms very quickly. See page 29 for more information about ATRA. The treatment for people with 'high-risk leukaemia' may vary slightly from people who do not have these factors. A research trial (AML-HR) is currently being carried out to test new types of treatment against the standard treatments for high-risk AML and your doctor may ask you whether you want to enter the trial. People over 60 with AML may be asked to consider taking part in a research trial to see whether more intensive chemotherapy is more effective in treating the leukaemia than less intensive chemotherapy. The trial is known as AML-14. Many people who are under 60 with AML may be asked if they would like to take part in the AML-15 trial, which is comparing the effectiveness of the current treatments used for AML. You will be given detailed information about any trial in which you are invited to take part. You may find that other people with leukaemia at the hospital are having different treatment from you. This may be because their illness takes a different form, so they have different needs. If you have any questions about your own treatment, don't be afraid to ask your doctor or nurse. It is often useful to make a list of questions for your doctor and to take a close friend or relative with you. Some people find it reassuring to have another medical opinion to help them decide about their treatment. Most doctors will be pleased to refer you to another specialist for a second opinion, if you feel this will be helpful. However, this can sometimes take time to arrange and may mean that the start of your treatment is delayed, which may not be advisable. Usually treatment for AML should be started as soon as possible. If you do not understand what you have been told, let the staff know straight away so that they can explain again. Treatments for leukaemia can be complex, so it is not unusual for people to need repeated explanations. Patients often feel that the hospital staff are too busy to answer their questions, but it is important for you to be aware of how the treatment is likely to affect you and the staff should be willing to make time for you to ask questions. You can always ask for more time to decide about the treatment, if you feel that you can't make a decision when it is first explained to you. You are also free to choose not to have the treatment, and the staff can explain what may happen if you do not have it. If AML is not treated, people usually live only for a few weeks. It is important to tell a doctor, or the nurse in charge, about your decision immediately so that your decision can be recorded in your medical notes. Many people are frightened at the prospect of cancer treatments, particularly because of the potential side effects. Some people ask what would happen if they did not have any treatment. Although many of the treatments can cause side effects, knowledge about how these treatments affect people and improved ways of reducing or avoiding many of these problems, have made most of the treatments much easier to cope with. Treatment can be given for different reasons and the potential benefits will vary depending upon the individual situation. In people with AML, chemotherapy is usually done with the aim of curing the cancer. Occasionally additional treatments, such as high-dose chemotherapy with stem cell or bone marrow transplants, are also given to reduce the risks of it coming back. If the leukaemia has returned after initial treatment, more treatment may be given to get the leukaemia into remission again. If the leukaemia is at a more advanced stage, the treatment may only be able to control the disease, leading to an improvement in symptoms and a better quality of life. However, for some people in this situation the treatment will have no effect upon the leukaemia and they will have the side effects without any of the benefit. If you have been offered treatment that is intended to cure the leukaemia, the decision whether to accept treatment may not be a difficult one. However, if a cure is not possible and the treatment is being given to control the leukaemia for a period of time, it may be more difficult to decide whether to go ahead with treatment or not.